A visual technology and search startup called PHIND took the stage at last year’s Startup Battlefield at Disrupt NY to debut what it was then calling a “Shazam for places” – that is, an app that let you snap a photo to learn about the world around you. Today, roughly a year later, PHIND is launching its production version, which focuses on helping users discover new places – including via browsing and text-based search – as well as gather real-time information about those places through a community-reporting feature, and more. Perhaps you can call it a “Waze for places” now? While the app’s earlier clever hook was its ability to turn photos into search queries, PHIND’s co-founder and CEO Rishi Jhunjhnuwala admits that this limited the app’s reach. “We realized we were only hitting the travel market with that, and we were actually shooting ourselves in the foot as we wanted to expand even further,” he explains. “That’s when we included text and category search…now we encompass more of the planning of trip,” says Jhunjhnuwala. With the updated, redesigned version launching today, PHIND is continuing along this path of enabling people to seek out new places from a distance. 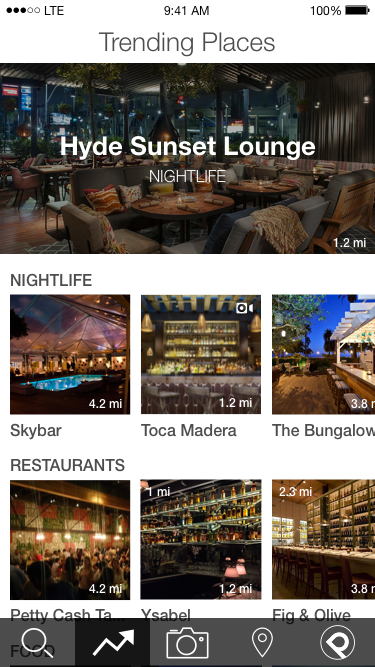 While the photo-snapping search feature is still present, the new app offers deeper integrations with services like Yelp, OpenTable, Foursquare, and Uber, so you can immediately learn about the places around you where you may want to eat, drink, or visit. You’re able to see things like the number of Yelp stars a place has, for example, or view photos, see how far away a place is, or even book an Uber right from within the app. The goal today is to better appeal to those who want an alternative way of finding places, instead of using Google Search or Google Maps, while also eliminating the constant app-switching that takes place when you’re researching a business. “It’s a simplified search experience,” says Jhunjhnuwala. In addition to the improved user interface that puts place information front-and-center in the app, PHIND is also now testing the waters with a community reporting feature where users can report back about the activity at a place at that very moment. For example, if it’s crowded or has long lines. 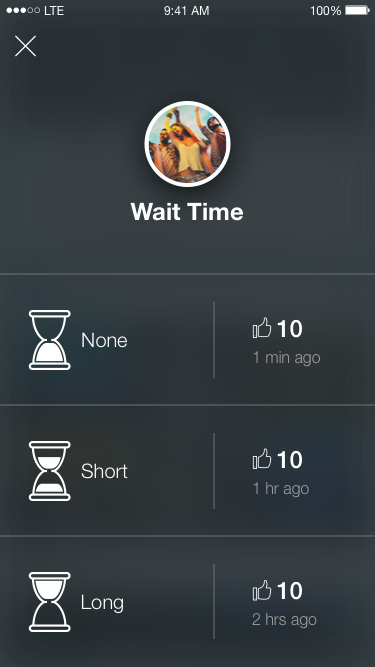 The number of reports will then influence whether the place is presented as “trending” within the app. This idea, however, is not novel – startups have tried time and again to do exactly this, including Visor, WhatsBusy, Dash, Density, SceneTap, Placemeter, and many others. The challenge is getting people to actually report in. Unlike with Waze, where the community data allows you to avoid accidents, take different routes, or not get busted for speeding, fewer are interested in sharing information about whether a place is busy. The impulse just isn’t there. The better solution is to collect this data passively – as Google has been doing since last year, where it presents busy times as bar charts right next to the place listing, thanks to the user location data it pulls from Google Maps. PHIND, however, believes it has a solution. It’s working directly with local business owners in L.A. in order to promote the app in that city instead of trying to focus on everywhere at once. Once it gets well-known in this market, it will then try to repeat the process in other major metros, like NY and San Francisco. To date, PHIND has been downloaded 30,000 times and reports 7,000 monthly users. However, the focus has not been on marketing, but on the technology improvements rolling out now, the CEO says. The new version of PHIND is a free download here on the iTunes App Store.